It’s shaping up to be an unusual year in crossties. And for wood crossties in particular, things are looking positively bizarre. The most widely used metrics for measuring the health of the wood crossties market is the Inventory/Sales Ratio (ISR). ISR is at 0.67, according to Jim Gauntt, Executive Director of the Railway Tie Association. That’s an historically low point for the level of demand for ties that is expected this year. In fact, Gauntt notes that just a further small reduction in ISR from 0.67 to below 0.66 would make it the worst this measure has seen since data was first archived in 1987. “That could signal stress in the supply-side for months or even years going forward,” Gauntt said. How significant is this challenge? Demand in 2018 for wood crossties was 21.2 million. Even if 2019 demand holds steady at that level, there are nowhere near enough ties in air-dry yards to fill that need, according to data from the RTA. In fact, plugging in a moderate 7% increase in green-tie procurement this year would push the ISR from the current unhealthy 0.67 to 0.55 by the end of 2019. At least in theory, inventories could recover quickly. “Tie production was off by 16% in 2018, so capacity should be there to do it. But there are so many other factors in play, it is impossible to know,” Gauntt said. 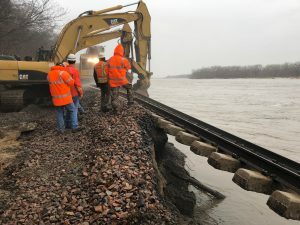 Of those many other factors, four—rain, China, the feds and Precision Scheduled Railroading—are particularly noteworthy, according to industry observers. Unseasonably wet weather in Arkansas and Missouri has put a crimp in logging, according to Koppers’ Gross. “We’re back into a shortage of supplies. Wet weather is a big contributor. Sawmills have a difficult time getting into the woods,” he said. George Caric, Vice President of Marketing for Stella-Jones Corp., sees a similar dynamic. “Wet weather continues to stymie crosstie production across the country. Tie inventories are at an all-time low and it doesn’t look to turn around anytime soon,” Caric said. But Caric notes that at least one part of the market seems exceptionally strong. “Commercial crosstie sales are improving with plenty of projects to support customers moving to support transporting goods by rail,” he said. Gross agrees, noting that commercial prices have been driven much higher. One potential boost on the demand side is a much-hoped-for infrastructure bill from the U.S. government. Tim Carey, Industrial Product Specialist at Lonza Wood Protection, says a dramatic push by the federal government could make a dramatic difference. 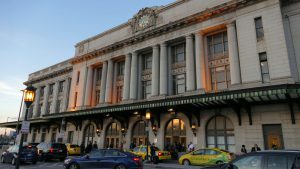 And even existing Federal Railway Administration grant programs to states can move the market, he said. That’s a wildcard that could hurt prices in the intermediate to long term. But the biggest wildcard in the market has to be the effects of PSR. As the Class I’s look to push their operating ratios ever lower through PSR methods, the railroads (and Wall Street) seem to be less enthusiastic than in the past about maintenance. On the concrete side of the crosstie world, things look a bit different. Transit construction is soaring. And maintenance spending is strong, too. “Projects that have been in the pipeline continue to come forward this year and we expect that improvement in performance to continue through 2020 due to growing federal government support,” said Steve Burgess, President, CXT, Inc. and Vice President, Concrete Products, L.B. Foster. In fact, CXT hopes that a recent acquisition will soon allow it to serve customers in the Western U.S. “Our acquisition of Carr Concrete, a concrete precaster in Waverly, W.Va., enabled us to expand its production footprint in the Eastern U.S. and add other concrete product offerings for the rail industry,” Burgess said. Carr recently added a new concrete batch plant and expanded its production capacity. 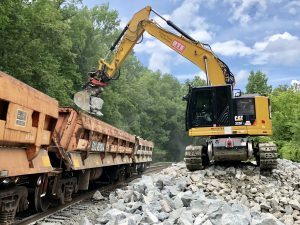 Going forward, Carr plans to offer other types of precast concrete products by leveraging existing relationships east of the Mississippi River with transit agencies and short line and Class I railroads. Over time, the company plans to introduce some of those products to customers west of the Mississippi River through sister facilities in Hillsboro, Tex., and Spokane, Wash. Similarly, Vossloh North America sees sufficient opportunity that it too is expanding production capability. The company is completing work on its seventh Concrete Tie facility in North America and was scheduled for startup in March 2019. The new facility has direct access to Canadian Class I networks. Previously, the logistics challenges of shipping from off-line U.S. facilities to the Canadian market “did not allow for the economic benefits of concrete ties being installed. With this facility dedicated to the Canadian Class I market, we know that concrete ties now provide the best life-cycle cost benefit and volume will grow significantly in Canada,” the company said. Meanwhile, Nortrak is similarly optimistic. Concrete crossties are largely designed using an outdated understanding of what demand is likely to be placed on them in the field, according to researchers at RAILTec at the University of Illinois at Urbana-Champaign. See their findings here. That seems to be the consensus among industry insiders. Composite ties may still be the new guy in the crosstie business, but the fight to win general acceptance is over. Linda Thomas, President of LT Resources, which handles marketing and sales for American TieTek, said the railroad industry now sees the value in composites. TieTek® Engineered Polymer Composite (EPC) crossties, switch ties and bridge ties are used by a wide range of customers in a variety of applications throughout the U.S., Canada and Mexico. The TieTek tie is the only engineered polymer composite tie to perform without failure at TTCI for 15 years, accumulating over 2 billion gross tons, and the only EPC tie to withstand the most recent SRI testing at TTCI, Thomas said. A newer player on the composite scene in the U.S. is Vossloh. Its Amalentic Tie material is polymer composite designed to be installed by conventional wood tie gangs. 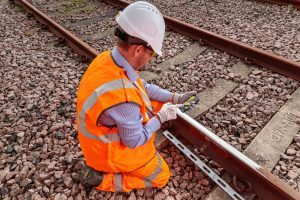 It has been in development and testing at Vossloh’s Werdohl, Germany facility over the past three years and will be commercially marketed by the Vossloh Tie Technology group. The company says it is working with Class I partners to complete field testing. Finally, Pandrol recently signed a deal making it the exclusive representative in North America for Sicut, which holds the license to manufacture crossties from recycled materials using technologies developed by Rutgers University and Polywood Inc. 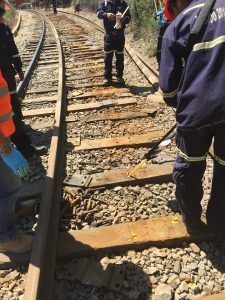 The big news in steel ties this year is that RailWorks Corp., a rail track construction and maintenance services provider, finalized an agreement in September to acquire NARSTCO, a manufacturer of steel ties and turnout sets. Based in Midlothian, Texas, NARSTCO makes ties from recycled steel, which RailWorks said erase the need for creosote, spikes, gauging, anchors and tie plates. “We believe that NARSTCO Steel Ties and Turnout sets solve a real problem in the crosstie market relating to expensive and frequent crosstie replacement costs and disposal fees,” said Tony Musa, president of NARSTCO. Disputes over world trade had an impact on those companies that service crossties in 2018. Industry insiders are hopeful that those problems will fade quickly. “Tariffs on parts and machine-related expenses have increased dramatically, and we are hopeful that this will turn a corner this year,” said Greg Spilker, Vice President and General Manager of Encore Rail Systems Inc. The big news for Encore, however, is that the company moved into a new headquarters in Broomfield, Colo., in May 2018. The new plant will allow for increased production and capacity. That’s much needed, according to Spilker, who says Encore is focused on increasing the size of its equipment fleet to better-serve an increased customer base that includes short lines, contractors, transits and mines in addition to Class I’s. Similarly, Rob Loomis, Business Manager, Performance Products Division at Willamette Valley Company, says new customers are driving changes at the company. Loomis notes that bridge maintenance can be particularly complex. That provides opportunity for suppliers with specialized products. 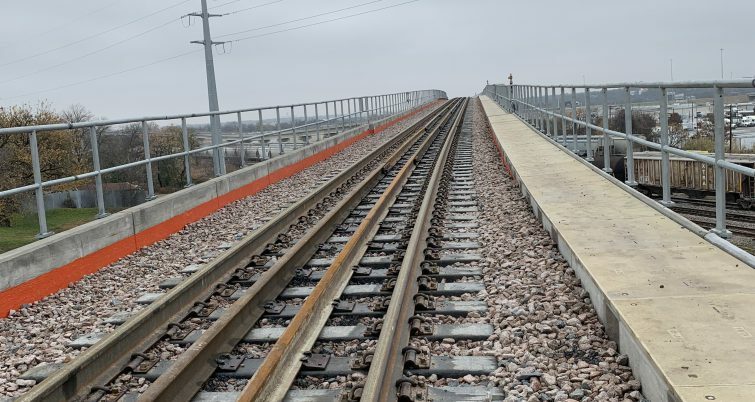 For bridge crossties, “our SpikeFast® tie-plugging material is commonly used to maintain track gauge, and the bridge bearing pads are repaired with our FastPatch® 5000, allowing of immediate return to service of the bridge,” he said. Jim Gorman, Corporate Vice President for Marketing for Nisus Corp., also sees growth potential in extending the life of bridge ties. Gorman notes that East Coast Right of Way Maintenance, Inc., based in Lenoir, Tenn., has developed on-track equipment to do remedial Cellu-Treat liquid borate treatments on existing bridge ties. It is currently providing treatments for a Class I. More Class I’s are switching bridge ties to the BTX® system, which allows for dual treatment of green bridge ties with Cellu-Treat Liquid DOT Borate and QNAP copper naphthenate. In addition, Gorman says he’s seeing more state railroads and DOTs, eager to improve worker safety, specifying QNAP® copper naphthenate for their crosstie and bridge tie programs. “QNAP copper naphthenate greatly reduces burns or skin irritation for workers,” he said. 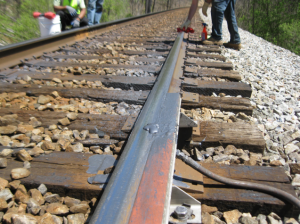 Railroad Solutions has developed a new type of ride-on tie-plugging application technology. The equipment delivers Sure Spike powder, not liquid, safely with the operator in a cab, keeping workers safer with a machine that never plugs up.